We’re excited to present the stunning new 3D animated music video for Involved‘s ‘Radiation Leak’, taken from their 2014 debut Revolving Maze. 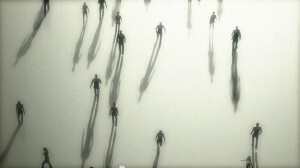 The video, created by Hidden Shoal’s Cam Merton, is a brooding sci-fi film noir set piece featuring ghostly silhouettes wandering through a smoke-filled city of glittering skyscrapers and glassy plazas. What at first seems graceful, peaceful and organised, soon appears menacing, like watching a sleepwalking populace trapped within a futuristic cage. Involved’s Revolving Maze fuses the psychedelic sounds of ’70s kosmische with ’80s electronic and more modern ambient styles, creating evocative, cinematic music. However, rather than being revisionist, the duo curate fresh sounds from a musical palette that spans 40 years. Lush synth tones are deployed with an innate sense of melody, leading the listener through widescreen narratives of enviable scope. This is complex, engrossing music that transforms with each spin. Check out the video at YouTube and Vimeo, and stream and buy Revolving Maze here.